The high demand for seaborne transport during the First World War, combined with Norwegian neutrality, created a boom for Norwegian shipping. Although Norway was neutral, the country had to balance the need to keep supply lines from Great Britain open, without angering the Germans too much. Freight rates increased enormously, ship prices and share prices followed suit, and there was a speculative fever in Norwegian shipping. Norway lost large amounts of ships and seafarers to German submarine warfare. Tenold contrasts the dramatic conditions affecting Norwegian seafarers during the First World War with the boom and increasing inequality at home in Norway. Before Fredrik had managed to put the remaining 11 stockings on his right foot, there was a muffled bang that reminded him of a powder charge. Although the first German bombs were way off their target, the attacks got gradually closer, and Fredrik and his shipmates were told to abandon ship. He ran back to his quarters, picked up his best suit, the watch he had been given for his confirmation and a box of letters from home, before jumping into the lifeboat, where he landed awkwardly on the captain’s lap. Fredrik’s ship, DS Nydal, had been delivered to the company DS AS Vestlandet, managed by Frimann & Pedersen, in January 1917. The ship had a crew of 23 and was on her way from New York to Bordeaux with general cargo. DS Nydal had the Norwegian red, white and blue painted on the side of the hull, in order to signal neutrality. However, this was of little use after the Germans introduced unrestricted submarine warfare on 1 February 1917. Being sunk twice in the span of 72 hours was not common, but the First World War undoubtedly took its toll on seafarers, ships and shipping companies. Norwegian neutrality had been challenged even before the Germans started their unrestricted submarine warfare. Interruption of Allied supply lines, by means of mines, raiders and the dreaded U-Boote, was a key element of the German strategy. By the end of the 1914–18 war, around half the Norwegian fleet had been sunk or had disappeared, and more than 2100 seafarers had lost their lives. These substantial losses occurred despite the fact that the Norwegian government on 4 August 1914 declared neutrality. The country had less than ten years’ experience of managing their own foreign affairs, and had no interest in the blocs, rivalries and political power play that had become an increasingly important part of foreign affairs on the Continent. Norway had perfected a policy of sitting still and hoping not to be noticed. When the main European powers started fighting, this stance was futile. Slightly more than a week before the invasion of Belgium and Luxembourg, Kaiser Wilhelm II returned prematurely from Balholm in the Sognefjord, north-east of Bergen, in his yacht Hohenzollern . According to his memoirs, he had learnt from Norwegian newspapers about the worsening relationship between Austria and Serbia, but the very same newspapers report that he received a dépêche when he was taking his afternoon walk on Saturday 25th July 1914. After reading the telegram, he abruptly returned to the ship, and left Balholm without warning at half past six in the evening.12 At the same time, 38 German naval vessels that were in Norwegian waters were told to mobilize and return to their homeland. When Hohenzollern travelled from the Norwegian coast to Wilhelmshafen in Germany , these waters were relatively safe. Just a few weeks later, the North Sea had become a strategically important part of the playing field and a crucial stage for the war theatre. Given the vital role that supplies and resources play during wars, the British attempt at isolating the German fleet and cutting off German supply became a lynchpin of their war campaign. As the US maritime historian Michael Miller has pointed out, the 1914–18 war at sea was not primarily about naval ships fighting for local and global hegemony and control. Rather, “the real sea battle in the First World War pitched German surface raiders, mines, and especially submarines against merchant shipping in an effort to interdict and destroy Allied overseas supply lines.”13 This was not soldiers against soldiers on land or marines against marines at sea—this was military might against civilian seafarers. The outbreak of wars usually leads to an increase in the need for seaborne transport. The belligerents need to move troops and supplies. Moreover, with normal trade relations interrupted, even neutral countries are forced to rely on more distant sources of supply, and often ships have to resort to inconvenient lengthy detours.14 As a result, the demand for transport capacity increases. Parallel with this, the amount of tonnage available in the open market falls. Ships are requisitioned by the authorities and ship losses increase as a result of enemy action. Bottlenecks, restrictions and time-consuming inspections in ports reduce the efficiency of the available vessels, and material and labour shortages make it difficult to keep up newbuilding activity in the shipyards. Shipping is no different from other markets. Increased demand and reduced supply usually have one immediate effect: higher prices. Norwegian shipowners had previously benefitted from the freight rate booms associated with conflicts in both near and distant waters. This time, the situation was even more favourable. The strong increase in international trade in the second half of the 19th century—often referred to as the first era of globalization—had already laid the foundation for the growth of the Norwegian merchant marine. However, the expanding trade also implied that Europe had become much more dependent upon foreign supplies to meet everyday needs. When the war broke out, Great Britain imported almost two thirds of the calories that were consumed, as well as much of the raw materials that kept the country’s industry going; cotton, wool, petroleum, various ores and rubber.15 Shipping was more important than ever. For the UK, superiority at sea was one of their main strengths—their policy had been “rule of thumb”-like: to have a navy that was at least as strong as the next two navies. The naval ships could be supplemented by vessels from the world’s largest merchant marine. Relatively soon after the war had broken out, British merchant ships were put under Government control, and the authorities also introduced official maximum rates and standardized contract terms. By the end of 1915, around 30 per cent of the British fleet had been requisitioned to contribute directly in the war campaign, transporting soldiers and other personnel, weapons and ammunition, provisions, etc. The war years did see a spectacular increase in personal wealth in Norway, though the distribution was uneven. Speculators made rapid fortunes, and showed their windfall gains in obscene ways. For the majority of the population, however, the increased cost of living and the difficulties of obtaining crucial provisions were the main preoccupations. From 1914 to 1920, prices multiplied by a factor of three, and rationing and black market premiums aggravated the situation. In other words, Norway managed to follow both the “poverty line” and the “line of action”. A similar balancing act was seen in international politics. Norway stayed neutral throughout the conflict, but was in reality strongly involved, and ultimately played an important role for the outcome of the war. A similar situation occurred in connection with fish exports. In 1915, foreign buyers of fish were extremely active in Norway, and it has been suggested that the Germans tried to corner the market.25 The Norwegian fishing industry was in a difficult situation. Although Germany and the Continent were the main targets for their exports, they needed “coal, petroleum, salt, tin, olive oil, hemp and cotton for ships and fishing gear”, and it was estimated that the British had a market share of around 85 per cent in the supply of these goods.26 For Norwegian fishermen, this was the worst catch of them all; Catch 22. They were in danger of losing the German market where they sold their fish, or in danger of losing the British inputs needed to satisfy this market. With regard to the merchant marine, two considerations had to be taken into account. On the one hand, transporting cargoes for other countries had been its main employment, and was an important source of revenue. On the other hand, the ships played a crucial role in ensuring that Norway had fuel, food and other necessities. The transport to and from Norway thus became particularly important during the war, and the shipowners found that the authorities increasingly restricted their room to manoeuvre. The Norwegian fleet reached a peak in August 1916, before the increased German aggression began to fully take its toll. More than 300,000 deadweight tons were lost in the last four months of 1916, compared with around 265,000 deadweight tons in the first two years of the war.32 The combination of a more violent German policy and a strong increase in the submarine fleet—which more than doubled during 1916—can explain the higher losses. A dispute about Norwegian exports of low quality pyrite to Germany led to a cessation of British coal exports to Norway from the end of 1916. However, “it was evident that the dependence of Norway on British coal” and the Norwegian shipowners’ large fleet made them “genuinely anxious to employ their vessels in the service of the Allies,” with whom they were already “on friendly terms.”36 In February 1917, shortly after the Germans introduced unrestricted submarine warfare, the Norwegian authorities accepted the demands, and the British stopped twisting the Norwegian arms. Around the same time, the British Minister of Blockade, Lord Robert Cecil, approached the Norwegian authorities with the view of purchasing tonnage.37 The basis for the approach was that “Norway had a greater amount of tramp tonnage to place on the freight markets than any other country except Great Britain herself.”38 The German escalation of the naval warfare—with a large number of much more efficient submarines—implied that the Norwegian fleet had become increasingly valuable. This paved the way for the tonnage agreement with the UK, negotiated in the spring and entering into force in the summer of 1917. The tonnage agreement was a strange beast; it was negotiated by the Norwegian Shipowners’ Association and the British legation in Oslo, but with both countries’ authorities—the British Government and the Norwegian Provianteringsdirektoratet [Ministry of Provisioning]—looming insistently in the background.39 The idea was that “all Norwegian shipping not required for the trade of Norway herself should, so far as possible, be employed in Allied interests, in return for a guarantee of the Norwegian coal supply.”40 As a result of this agreement, neutral Norway devoted its most important asset—the merchant marine—clearly to one side in the conflict. By this time, there was no doubt about where Norwegian allegiance lay. One of the main reasons for Norway’s westward stance was the deteriorating view of Germany in public opinion, which made it easier for the authorities to align their policies with the Allies. The manner in which submarine warfare destroyed human lives and merchant ships—neutral lives and neutral ships—changed public opinion and inflamed anti-German sentiments. For the majority of Norwegian citizens, Germany and the Central Powers became “the enemy” during the course of the war. The accomplices of “the bomber baron” were given relatively long jail sentences in Norway. “Baron von Rautenfels” himself was expelled from the country, but was given an amnesty in Germany and escaped prosecution.51 This is characteristic of the international political situation during the war: the Norwegians pretended that they were neutral, and the Germans pretended that they respected the neutrality.52 During the First World War, political, economic, strategic and military considerations overlapped and clashed, creating uncertainty and complexity for individuals and for businesses. In the UK, Denmark and Sweden the authorities had established insurance arrangements, but the value of the Norwegian merchant marine, relatively to the size of the public coffers, made such a solution difficult in Norway. 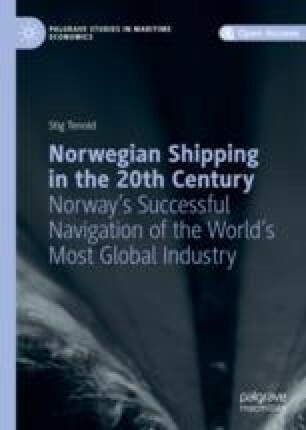 Moreover, it was claimed that “Norwegian shipowners were known for chartering their ships on risky voyages, almost like a predilection, if the profits encouraged it”—not a strategy that will convince insurers.55 Regardless of whether or not this claim was correct, if this was the general opinion, it would negatively affect shipowners’ ability to obtain affordable insurance terms. A committee was established on 11 August 1914, headed by Joh. Ludwig Mowinckel , Bergen shipowner and President of the Odelsting, one of the Parliamentary chambers. The committee worked rapidly, and the day after it had been appointed suggested the establishment of a compulsory and mutual insurance arrangement, where the authorities granted a temporary guarantee. Consequently, the costs of every individual loss would be shared by everyone. This solution was supported by both the politicians, who wanted to limit their own risk, and the shipowners, who wanted to limit the authorities’ influence. The increasing insurance costs were warranted. Neutral Norway suffered heavily during the First World War. More than 2100 seafarers lost their lives. Almost 950 ships, with a tonnage of more than 1.3 million gross register tons (grt)—corresponding to around half the 1914 fleet—were lost.56 Given that they were sailing for a neutral nation, the Norwegian ships were unable to retaliate when they were attacked. Figure 3.1 shows the official Norwegian loss figures during the war. With the introduction of unrestricted submarine warfare in February 1917, and subsequently with the US entry into the war, developments changed dramatically. The new German policy—targeting all ships around the British Isles , outside France and Italy and in the Eastern Mediterranean—implied that the target became the ships, not their cargoes. The introduction of convoys in the North Atlantic in the spring of 1917 managed to drastically reduce the losses in that region, and the decline was strengthened by the deployment of Norwegian ships to less-dangerous waters after the tonnage agreement. The loss of a ship was not necessarily bad for the company’s business. In the summer of 1917 it was claimed that a share in DS AS Vestlandet, the company that owned the recently torpedoed Nydal , was “a good paper,” partly as a result of the income associated with the sinking.58 The ship’s insurance had amounted to more than NOK2.1 million, and the company had a book profit of NOK1.4 million as a result of the insurance payout after the Germans had sunk the ship.59 While such profits were subject to income tax and war gains tax in the first years of the war, from July 1917 insurance profits became tax exempt if they were reinvested in new shipping capacity. While the seafarers were counting their blessings, speculators were counting their money. The war led to an enormous increase in freight rates, and in revenues. In 1916, gross freight earnings—what foreigners paid for Norwegian transport services—were more than four times higher than they had been five years earlier, even when we take inflation into account. This massive inflow of money fostered optimism—shipowners reinvested their earnings, and shipping investments became attractive even to those outside the sector. Still, economic success was primarily a question of good or fortunate timing. “The shipowners that had bought ships in the first half of 1914 […] were winners in life’s peculiar lottery” and for the first years of the war values increased steadily.64 During 1915 the price of a relatively large ship multiplied by a factor of five, and the second-hand price exceeded the newbuilding price for a similar vessel by 80 per cent due to its prompt availability.65 The price of the shares of shipping companies that owned such tonnage naturally soared. 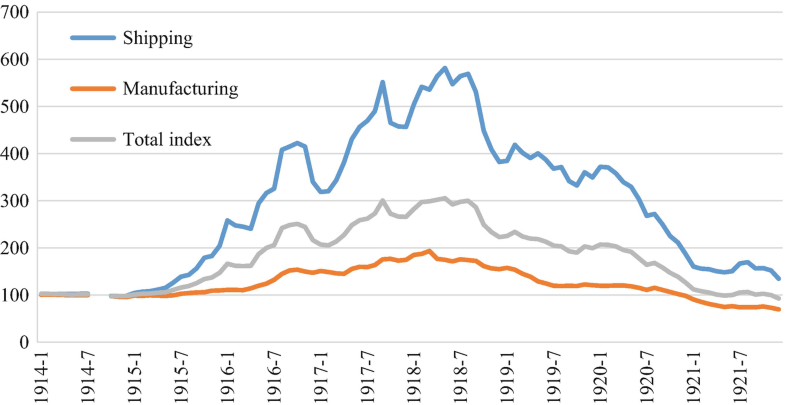 From the end of 1914 to the peak in 1918 the value of shipping shares multiplied by a factor of almost six. Because freight rates showed particularly pronounced boom movements, shipping shares became the favoured speculative object among those looking for a quick boost of their personal wealth. There was a real economic fundament for the boom in the beginning; the high freight rates led to record profits—even after the increases in coal prices, wages and insurance costs were taken into account. However, as the war progressed, the development acquired all the properties of a “bubble.” Investors ventured their money based on the expectation of continuing share price increases, rather than on the basis of future revenues. From a societal point of view, the development was unfortunate. The war, inflation and rationing accentuated the difference between the haves and the have-nots. Shipping investors undoubtedly belonged to the first group. In 1917 inequality in Norway was at its highest point in modern history.68 Quite a lot of people became wealthy from speculation , but most major maritime cities typically had one or two entrepreneurs that stood out. This development was most pronounced in Kristiania and Bergen, where we find the most liquid stock exchanges. Tryggve Sagen, one of Hannevig’s partners, is another rags-to-riches−to-rags story in Kristiania, while in Bergen the boom was associated with Erik Grant Lea.74 He was a serial entrepreneur, who was also the victim of comparisons with King Midas and Aladdin.75 Like many “jobbers,” Lea had managed to get a large share of outside capital in his companies; in the first one he owned only 16 of the 750 shares.76 This made him vulnerable for shareholder revolts, and in 1917 six of his companies were taken over by another “typical speculative partnership”—a dog-eat-dog world. The new managers were Bjørnstad and Brækhus, who also took over DS AS Vestlandet, to benefit from the insurance payout after Nydal had been torpedoed.77 In the period 1917–1920 Bjørnstad and Brækhus “raided” 15 different companies to gain control of valuable tonnage. The speculative fever was fuelled by an abundance of money so large that even crooks from abroad were attracted to it. The Australian Mister Angus, who promoted the idea of a self-stopping locomotive, left the country after having deprived investors of their funds. “There were invitations to subscribe [to new shares] that even the most ignorant must have understood were meaningless.”79 In the absence of good investment objects, the wealthy—and in particular the newly wealthy—chose risky investments and conspicuous consumption. Fine art was hardly a concern for the population in general. For most Norwegians, the abundance of money was seen mainly in rising prices, and their bitter experience was that wages did not keep up. In 1916 and 1917 demonstrations and strikes were frequent in Kristiania and the other major cities. “Sailors are drowning, people are starving, capital is reaping the benefits,” was the disillusioned message on a poster in a rally against the high cost of living. As a result of the increasing inequality, social tensions grew—particularly in the cities and other places with manufacturing industry, where food was bought, rather than grown. Ordinary workers—and even more so the unemployed—struggled with rationing and the rapid increase in the cost of living. The lavishness and luxury that characterized the lifestyle of the most successful speculators were provocative. The result was a feeling of contempt and a growing class consciousness—syndicalists, communists and anarchists gained support. The revolution in Russia had created hope. Norwegian politics became polarized and was permanently changed. The Norwegian authorities and shipowners managed the difficult balancing act that the First World War represented relatively well. At the same time, it is evident that in public opinion, shipowners lost some of their sheen—they were now more closely associated with speculators than with society builders. There were still shipowners who played an important political role—Joh. Ludwig Mowinckel, for instance, would go on to become Prime Minister on three occasions in the interwar period. However, the boom had been particularly pronounced in shipping, and although fly-by-night “newcomers”—who saw casino-like opportunities in shipping—had been responsible for the worst excesses, many long-term, responsible shipowners were also tainted in the public’s perception. When peace returned in November 1918, many things had changed, both in Norway and at the international stage. As shipowners prepared for the post-war boom, the “first era of globalization” was still an ideal. Unfortunately, the 1920s and the 1930s never lived up to the expectations. Based on the recollection in Ilboe (1970, 53–62) and the report from the maritime inquiry in Sjøforklaringer over norske skibes krigsforlis, 1914–1918. B. 2: 1ste halvaar 1917, 496–499. The U-boat in question was UC-72, under the command of Oberleutnant zur See, Ernst Voigt. Brochmann (1928, 114–115) and the report from the maritime inquiry in Sjøforklaringer over norske skibes krigsforlis, 1914–1918. B. 2: 1ste halvaar 1917, 501–502. For a captain’s account of the difficulties of navigation in such waters—and in wartime in general—see Øvreseth (1932), which also includes maps detailing the extent of the mine operation. Berg (1995, 71–98). The four major powers signing the integrity treaty were France , Germany , Great Britain and Russia . For the text of the North Sea Declaration, see Scott (1908, 200). In fact, Belgium —sharing the Norwegian naivety and referring to its policy of perpetual neutrality—was the only other North Sea country that had not signed the 1908 agreement. With regard to Norwegian goods exports, Germany was the second most important country—the 1913 share of 21 per cent was only toppled by the 24 per cent going to Great Britain and Ireland. However, almost 30 per cent of Norwegian imports came from Germany —while the British share was 25 per cent; Statistics Norway (1914, 55). Still, these figures disregard the trade in services—including shipping—where Great Britain played the key role. The commodity trade with Germany exceeded the British trade by 6 percentage points. If we include the gross freight earnings from shipping services, Norway’s trade with Great Britain exceeded the trade with Germany by approximately 7.5 percentage points. It has been claimed that Wilhelm II had a particular interest not only in Norway, but also in Norwegians. Based on the belief that their grandfather was the illegitimate son of Der Kaiser, a family on the west coast in 2012 changed their name to Hohenzollern; Aftenposten, 15 February 2014, 34–37. For instance, rather than sourcing grain from Europe, Norway had to turn to the Americas. In 1913 Norway imported 50 tons of barley from the United States; by 1916 this had increased to almost 50,000 tons. Over the same period wheat imports from the United States increased from 2400 tons to 74,000 tons; Statistics Norway, Norges Handel 1913, 1914, 97–98 and Norges Handel 1916, 1918, 105. Imports of rye from Russia and Germany had amounted to more than 176,000 tons in 1913—by 1916 the imports were zero. Albion and Pope (1968, 233). The article, originally in Norges Handels og Sjøfartstidende , 090814, was reprinted in full in Bergens Tidende, 120814, 1 and by 21 August it had also reached the newspaper Nordkap. This offensive—in both meanings of the word—attitude was typical of the general consul . After the war, Storm offered his services to the Ministry of Foreign Affairs. When they declined his offer to act as “Envoyé Extraordinaire and Ministre Plénipotentiairie” in South America, his response was to publish an 80-page pamphlet about the politicians’ “obstruction” and “tepidity”; Storm (1920). Based on the tone of this and other of his writings, it is evident that Storm today would have felt very at home in the comment section of online newspapers. Norges Handels og Sjøfartstidende, reprinted in Tromsø Stiftstidende, 190814, 1. Germany was the most important recipient of 24 of the 30 different types of fish and shellfish listed in Norwegian statistics in 1916; Denmark received more lobster, and the UK more salmon. With regard to canned fish, Germany was the leading importer in all categories, receiving marginally more than 50 per cent of all canned fish exports; Statistics Norway, Norges Handel 1916, 1918, 131–135. More than 8000 Norwegian ships entered ports in Great Britain and Ireland in 1913, compared with less than 1800 ships entering German ports; Statistics Norway (1916, 48). The proportion of third-country trade was also higher for the British than for the German trade. Although Germany , as previously mentioned, actually supplied a higher share of Norwegian imports, the essential nature of the British products—in particular coal—gave them an advantage there as well. Hjort (1927, 14); on the agreement between the UK and Norway regarding the sale of fish, see Hjort (1927, 9–193). As a result of the British dependence on imported foodstuffs, the entire exports of meat from Australia and New Zealand, and most of the Argentinian exports, had been bought up by the Board of Trade. As early as in November 1915 Sweden had denied submarines use of its territorial waters, except in a surface position in times of distress. A similar Norwegian resolution came 11 months later, and had only one exception from the total ban—submarines could enter Norwegian waters to save human lives. Schreiner (1963, 134 and 304); refers to ships lost as a result of war hostilities. Hodne (1981, 448–449) and Klovland (2017, 10–12). Schreiner (1963, 166) and Albion and Pope (1968, 241). The fact that the British had their own Minister of Blockade illustrates the crucial role of this aspect of the war. Ironically, the Rt Hon Lord Robert Gascoyne-Cecil, First Viscount Cecil of Chelwood, CH, PC, QC, was in reality a keen supporter of free trade, and in 1937 won the Nobel Peace Prize for his work with the League of Nations. The nature of the agreement implies that there was no signed contract. Instead, the previous correspondence was used as the basis for the arrangement ; Schreiner (1963, 176–177). Estimated on the basis of Fayle (1923b, 261); ships in national trade with the UK are excluded. Fayle (1923b, 47); see also Hurd (1924, Vol. II, 244). Berg (1995, 228–244); in the end, the fish exports were capped at 48,000 tons. The term “the neutral ally” is linked to Riste (1965). Four of the 14 spies that were arrested worked for Det Bergenske Dampskipsselskap, Bergen’s leading shipping company. Due to the company’s relatively limited losses at sea, the British authorities insinuated that “the owners may not have been completely ignorant of the malpractices”; see Keilhau (1951, 331–334). Bergens Tidende, 301117, 5 and 7–9. In addition to animosity against the accused, the basis for the “riots” was the relatively low number of police officers controlling the long queue of curious onlookers. Dagbladet, 230617, 1; Søhr (1938, 76) and Hambro (1958, 168–185). The German Embassy had been invited to the opening of the sealed trunks, but did not turn up. When it was proven that they had broken the diplomatic rulebook, an obscure military agency was blamed. Nilsen & Thowsen (1990, 10). See Fig. 3.1, which is based on Statistics Norway (2000), Table 115, 115 and Statistics Norway (1948), Table 131a, 248. In addition to the data presented there, 943 seafarers and 69 ships with an aggregate tonnage of slightly more than 60,000 gross tons disappeared during the war, most likely as a result of mines or torpedoes; Statistics Norway (1919, 63). While these vessels are mentioned in the footnotes of subsequent statistics, the seafarers have disappeared there as well. Moreover, one sailing ship and three other ships sunk by mines in 1919, which left 24 sailors dead, are not included in the data. Figures for 1914 refer to the period after 1 August, while 1918 refers to the full year. Keilhau (1927, 319–320). Wilhelm Christian Keilhau was Professor of Economics at the University of Oslo. He gradually reoriented his writings towards economic and business history, and his prolific authorship includes several books that were written because he had an axe to grind. Keilhau’s uncle had been Minister of Defense in Norway in 1914, but was replaced two days after the country had declared its neutrality. Bergens Tidende, 260917, 7. A misprinted telegram about a torpedoed ship plays a central role in the Norwegian rags-to-riches “yuppie comedy classic” Bør Børson jr.; Falkberget (1920, 182–188). Pedersen (1952, 170). In April 1918 this was increased to three months. Some shipowners were more generous than others; Fred. Olsen offered torpedoed sailors wages for the rest of the year, even if their ship had been sunk in January. Kloster (1935, 40). In one case, the sale price of a ship increased by more than 300 per cent from May to December; Kloster (1935, 41). Figure 3.2: Based on Keilhau (1927, 344–346). Data refer to end of month. The total index consists of the following indices (weighting in parentheses): Manufacturing (1/3); Shipping (1/3); Banking (1/6); Insurance (1/15); Whaling (1/15); Transport, etc. (1/30). Aaberge et al. (2016, 22). See the advertisement in Morgenbladet, 140215, 11. The Norwegian term for the period is jobbetid , referring to the jobbing of stocks—short-term investments looking for rapid profits, often associated with the British South Sea Bubble in the 18th century. Dagbladet, 281017, 6. King Midas should be well-known, and “Alladin” is a mis-spelt “Aladdin.” “Brewer Jacobsen” refers to Carl Jacobsen, founder of the Danish brewery Carlsberg and regarded as one of the most successful businessmen in Scandinavia. Askeladden is one of the main characters in Norwegian folk tales, typically succeeding where others fail. Hannevig died, but the court cases lived on. In March 1960, the Norwegian Parliament discussed the aftermath of the case for the ninth time, as a response to a decision in the US Court of Claims the previous year; Norway, Parliament, Stortingsmelding 60 (1959–1960). On Sagen, see Haugstad (2017). See Tveit (1972) for a biography of Lea and reference to the comparison, and Imset (2009) on Hannevig. Keilhau (1923, 44). The book was published anonymously, with no reference to the author. In recent years, two fascinating books that deal with the link between the war profits and the arts have been published; Haugstad (2015, 2017). The latter book is a biography of Tryggve Sagen. Schreiner (1963, ii). In 1915 it was decided that the Norwegian Shipowners’ Association would function as an employers’ organization for the seafarers, and while this was initially of limited importance, it became an important role when peace returned.